Nearly half of the homebuyers and thirty percent of people refinancing mortgages in California chose interest-only loans last year, according to research firm LoanPerformance. The nationwide numbers are not so high — 32 percent for homebuyers and 20 percent for refinancings. OMFG! What are people thinking? Oh wait, they're thinking the home valuation faeries are going to make it all better during the night. Which may or may not happen, but eventually the loan will come due. What makes it worse is that many of these loans are allowing people to pay even less than the interest. In that case, the homeowner who does not want to sell will one day be forced to make much higher monthly payments just to keep his house. And when that happens, it is an unfortunate fact of economics that cash flow and asset/liability balance are independant concepts. Many businesses go under each year with tons of equity on their books. Wow. Most impressive. Logic indicates either this woman plunked $300,000 down on a house that she won't even pay the full interest amount on or that she can't figure out 9 + 3 = 12. I know which one I believe. And if someone offered me 25% more than my house was worth, I don't think I'd be quibbling over a few grand either. But it's not just 12k added on to her loan unless she sells the house today. Do you really think the lending industry won't add interest on the unpaid interest that's accumulated to the principal? Uh, no. That's a time honored tradition. The missing concept here is amortization, which is a good thing when you pay down a loan but a nasty little bugger when you don't. Anyway, I realize I'm off on a rant, but people are going to lose homes in this eventually, simply because they can't be bothered to apply concepts they learned in grade school math to life out in the adult world. It makes me really irritated because when it comes down to it I have to side with the banks. They don't force anybody into these near ponzi schemes, they simply dangle them as one of many options because they're competing for business. It is the home buyer who wants something for nothing and gambles on the housing market that ultimately chooses this loan. I'm very sorry Mr. and Mrs. Smith may one day be forced to sell their home and have next to no principal- or even addition debt- to show for it, but they created their own problem. At least they won't be alone. Does anyone else find this more depressing than reassuring? Today, as I waited for Suz's Dad to come pick up the turtle (no that's not code for anything- I was just turtle-sitting) I started in again on that black hole that is our upstairs room. It's a general catch-all and is mostly used just to house a humongous weight set, because in earthquake country the best place to put a load of free weights is in a top floor room directly above a bunch of A/V equipment. Ahem. Anyway, I started cleaning it out again. Each time, I manage to whittle the chaos down a little more. But it's hard. We're not only pack rats but sentimental pack-rats. The worst combination in the battle against clutter. Besides, Tony and I have been so many different people over the years that sometimes the stashed tidbits are all we have left of those lives. There are some school notes between Lila and I back when we were little grade school revolutionaries, Tony's prom pictures where he's quite dapper and straight-laced, sorority formal pictures where I'm just as painted and shellacked as every other co-ed, left over art cards from the stack we sent out announcing our wedding, about sixty pounds of my old coast guard axillary paperwork, Tony's high school diploma, a gaming dice bag, a painted BDU jacket with the arms torn off, a couple of Ren Faire costumes, Tony's racing car mags, my investment books, tons of comic art in various forms and hockey, hockey, hockey paraphernalia everywhere I looked. When we were really into hockey, we obviously had too much disposable income because the stuff is everywhere. But that gave way just like everything else, and the marker for its passing was a bright yellow MSF handbook neatly tucked on top of a stack of Beckett Hockey magazines. The magazine boxes were very interesting because they reminded me of geology and relative dating. The motorcycle mags went down to a certain strata below which cars and hockey populated. When I dug down far enough, the sailing magazines started filtering into the mix. I've got about three full magazine boxes that are going into the recycling just from what I did today. That's probably six to eight paper bags worth. Yeesh! I have no excuse for why we hold onto some of that stuff- and yet, I know I haven't culled a tenth of what I need to in there. But it's hard. I may not be any of the people that bought or made those items, but I always get the idea in the back of my brain that someday maybe I'll become them again. It's like wanting to return to almost every place I've traveled. Maybe that's why I leave some items, to make a trail of breadcrumbs just in case. I know I'll never again be sixteen and working to subvert the system, or eighteen and working the system to my social benefit. But for a few seconds when I read a letter or a piece of writing or hold a photograph I feel like I am. I guess it's worth having these untidy spaces in my life to be able to keep the memorabilia around. Maybe all the untidy spaces in life are nothing more than the price of living different lives in the span of one. If that's the case then, I'll happily keep our bulging closets in order to see who we get to become next. California Triumph just put into service six brand new Triumph Scramblers. These will be popular so be sure to ask your service advisor to reserve a Scrambler for you when you book your appointment. You'll feel just like Steve McQueen riding off on a Scrambler for the day... but please, no jumping of barbed wire fences... Remember you signed a loaner waiver! You know one post ago, when I said I reserve my squees for smaller mammals? Now would be the time. Mega Squeee! The picture above can't do the sheer goatage justice as it's only showing a small part of the flock. But all you capraphiles out there should know that at this very moment there are hundreds of goats grazing contentedly on a vacant field right by my house! Why so many goats in suburbia? We leftist commies use them sometimes instead of herbicides to clear unwanted brush. 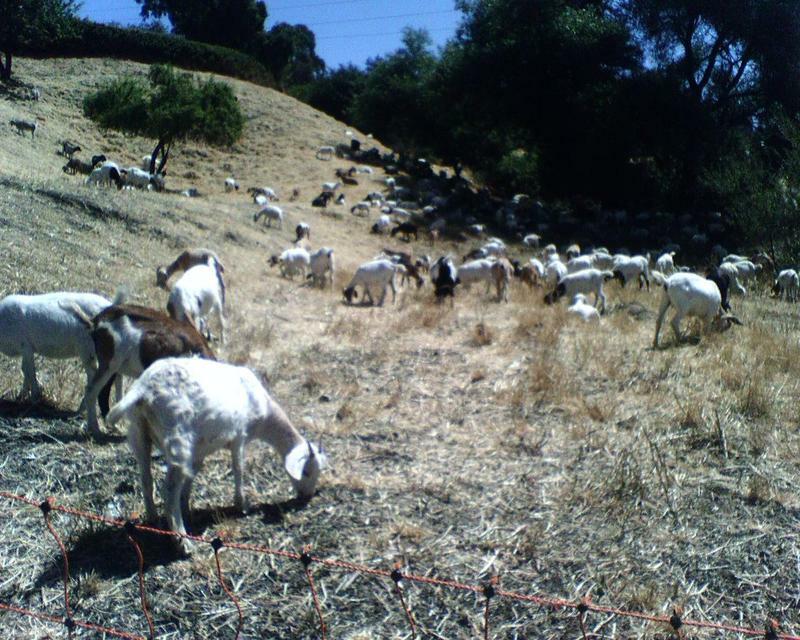 Goats turn brush into fertilizer very efficiently, and changes in topography don't really matter to them. There are so many goats here right now that I'm hearing about one byehh per second. So it probably won't take long to clear this field. They rather remind me of the sheep in a Tex Avery cartoon. I'm dying here watching them. Soooo cute! Tony, who informed me of the goats because he saw them first, also made note that our goatquotient (tm) today better remain equivalent to yesterday's. They're so adorable though. One day, we'll have land. And goats. Saturday, Ceej and I headed up to Berkeley for a bit of shopping. (Gurlz only, no boyz allowed.) We didn't really have a plan, but we had a starting point. We hit an occult store in north Oakland because we both wanted it for an idea of place (setting) for fiction writing. I actually had a few things that will wind up in stories at some point, just because they have to be shared. The leetle shop was run by a middle aged man and a somewhat older woman, both so sweet as to be out of place here in California. I adored the woman immediately, and wondered if she didn't live above the shop, baking cookies and stewing newts in some little Deco age kitchen on the weekend. Soooos adorable! I'd squee, but I reserve that for littler mammals. Anyway, after that, we hit a religious store because it was just up the street. I am fascinated by religion as long as I'm not required to actively participate, and the store was beautiful. I came very close to purchasing an icon plaque just because it was so nicely rendered in bright steph-colors. Only a mental catalogue of the walls in my house, none of which had an appropriate spot for the plaque, kept me from getting it. Then we had intermission at Bittersweet. That's the amazing chocolate shop that I've keep dragging people to because it's a bit too hedonistic to visit alone. Their chocolate drinks are to die for- possibly literally since it can't be doing good things to my arteries. I have found a new favorite in the White Chocolate Dream, which I've already tried to replicate at home. Finally, we attempted Telegraph Avenue. This was fun. I've never been on Telegraph with anyone who actually knew their way around the area. Ceej spent some grad school time there studying higher math. Too cool. Made me a bit wonky because I can't even seem to jump the right hoops to get my normal degree out of the way. But you do what you can with what you've got. Ceej has never seemed to mind slumming with me. We hit a few cool stores, had lunch and I wound up dropping some cash at Amoeba Records. C'est la vie. I'd been pretty good up 'til that point. Since being in the area was firing nostalgia in Ceej like the scent of gingerbread at Christmas, we wound up on campus. There it was particularly fun to have a guide. I got to ask tourist questions and she had ready answers. She even indulged me in going up the campinile. Which means bell tower, btw. Yes, I asked. German major, remember? All those Romance languages might as well be Greek to me. (Maybe worse than Greek, since I took some Russian.) The view was fun, both of the surrounding area and of the ginormous bells about ten feet over our head. There were ten of them, I think. Eight smaller- maybe four feet in diameter- and two larger ones- really darn big- but don't hold me to that. We were also talking and looking out while Ceej was identified buildings for me. Eventually we had coffee then headed home, straight into traffic. I dunno what it is about Berkeley. No matter which route I take and what time of day I take it, there is always heavy traffic heading south from Berkeley. But Ceej was driving, so I didn't turn into a snarly, nasty beast like I would if I were behind the wheel. We came back to the house and played with perfumes while Tony studiously ignored us in favor of Warcraft. I know you're reading this, you've already confessed to it. So I thought I might let you know that this weekend, like every year in late August, Goodguys Rod & Custom Association has their West Coast Nationals at the Alameda County Fairgrounds right down the street from us. The City of Pleasanton is happy to have these amazing cars take over their tiny streets for the weekend, going so far as to proclaim it Hot Rod Week. Supposedly there are upwards of 3,500 of these amazing vehicles putting around this weekend. For two years running, Tony and I have stumbled across the event while innocently going to dine in downtown Pleasanton, a few blocks from the fairgrounds. Show participants love to take their most prized possesions out for the evening. so we see cars cruising the strip that could have rolled right out of a museum. It's not surprising to see so many beautiful classics given how kind this climate is on them. But it is impressive. This is definitely the sort of thing a car aficionado might want to fit into a trip to California. Especially if he has family he could stay with only a few miles away. Well, I got my first BPAL order today. Finally. Only took most of the month. But worth it. I have a couple I am already in happyluv with. London is a beautiful soft rose, Sea of Glass and Raven are fresh. Port au Prince becomes drastically different- but intriguing- scents on Tony and I. Dorian is whisper light and sweet. And there are many left to test, because they were most generous with their free samples in the shipment. I am very pleased to have all these wonderful new perfumes to try. Except for one, which I am sorry is in the house at all. Probably not the perfume's fault so much. It's moniker is New Orleans and it has jasmine in it, which I only like on the petal and in small doses. Any more than that and I start feeling slightly ill. So not one I would order. But it was free. Which was just as well, because the lid leaked in transit. Slowly spewing forth jasmine scent like sarin. It was lying in wait for me on the outside of some of the other bottles and I got residue on my hands while testing, not realizing what was going on until three perfumes smelled like exactly the same noxious combination to me. I couldn't smell any of the oils in the bottles through the tiny amount of New Orleans on my skin. It had reacted that strongly, turning into the steph equivalent of pepper spray. And it wouldn't come off. So I washed my hands, and it wouldn't come off. I scrubbed. I even used stainless to try to break the bond like it was an allium. It wouldn't come off, in case you're wondering. I gave up and tried to ignore the waft of dead flowers. At least until my head started to throb. That's when I threw in the towel and pulled out the big guns. Ten minutes and a fair amount of vinegar later, my hands no longer smelled of pollen-y jasmine. But it's still out there on the dining room table, waiting, corrupting the rest of the shipment. Sigh. I've always liked the idea of New Orleans before. This must be some karmic get-even for thinking Anne Rice is a hack. First Ceej got me into BPAL, which while extremely satisfying is a bit indulgent. Now, Zefrank- admittedly not a close friend since we've never met- just showed me all the sweet shops near my house. I've lived in Hayward for nine years now, how come it takes a New Yorker to tell me I'm less than five miles from the Ghirardelli Factory Outlet? Holy cow! That could be more dangerous than living on the fault line, which people warn me about all the time. Later: Yes, I did pop by. Just to, you know, see what was there. Chocolate was there, in case you were wondering. I didn't buy any half gallon jugs of syrup (regular, white or caramel) just because they were $5 instead of $20, so I'll call that a win. Or at least a mutual nonsuccess since I am a few bars to the worse. Fortunately, it was a hot day and I wasn't headed home any time soon or the collateral damage could have been nasty. But I know where I'm heading before I ship out the annual Christmas packages this year. I think the candy might be cheaper than packing material. My math class, soon to be bane of my existance because just a titch slow for my needs as an OCD sort of person, had its first quiz today. The teacher wrote questions on the board and I answered them as I was copying them down because the questions really were that sadly fundamental. It was horrific. I mean twilight zone 'why do the people around me look like they're concentrating' sort of fundamental. So I tried to keep myself from being obvious even though I was stuck in the front row because I was late. Years of experience in looking like I'm working on paperwork got me through. Finally, FINALLY, someone else handed in a paper so I did as well. The teacher gave me one of those looks. The other paper, I realized, was the attendance sign in sheet that had been making the rounds. In an effort to compensate for my mortification, I started clockwatching. It was over ten minutes before another paper came in. I think today might be someone else's anniversary, too. Each of those rose petals was individually taped. Tape. At LEAST four dozen pieces. On a hot day. 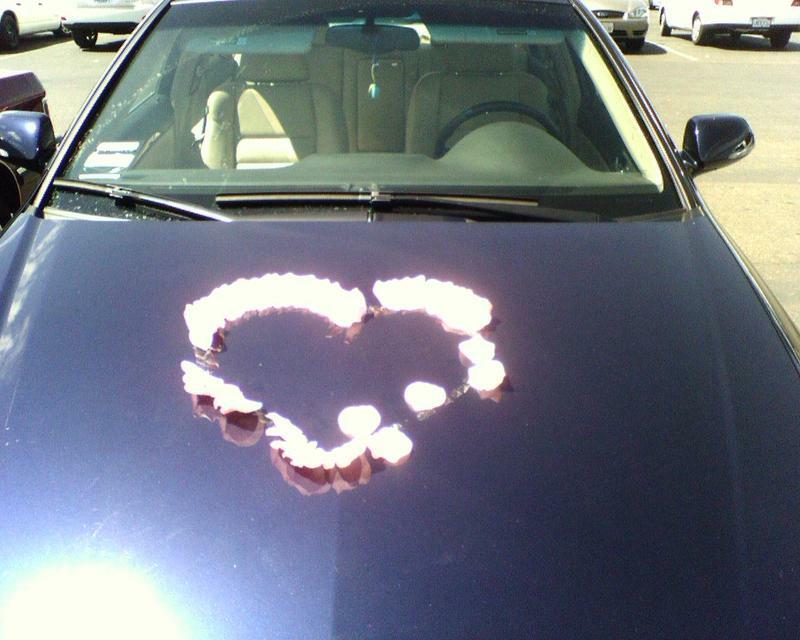 Still it's very cute and romantic in that 'glad it's not my car' sort of way.